Over the years, the doorstop or door stops as some people may write have included everything from a pair of slippers to a dog whilst taking a nap! What a doorstop does is quite simple yet an ingenious solution. Doorstop do exactly as the name suggests they stop the door or door handles from hitting the wall behind them. But wait there’s a more attractive and permanent solution than your new slippers! To eliminate damage to your walls the best solution is a fixed doorstop and depending on your needs and the room in your house that you will be fitting it we offer various designs and fixing types of doorstop. One of the most popular choices used within living rooms and bedrooms are our skirting board or wall mounted fitting types. Available in a selection of finishes including satin and polished stainless steel both providing a modern appearance. 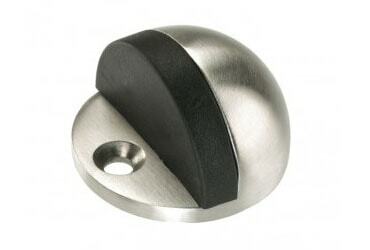 For bathrooms and kitchens or for use behind heavy doors our floor mounted doorstops make a great choice. Select from the cylindrical shaped or oval floor doorstop which is especially good when the bottom of the door is less than a centimetre from the floor. When fitting the wall mounted type ensure that the wall that you are attaching too has framing behind the contact point to screw into. This is important else with time and use it’s likely it will be pushed through the wall creating yet another DIY job for the following weekend. With floor mounted doorstops you should always find you have something solid to screw into and as long as it’s a level surface you can position it where ever you choose. Our last tip on selecting and fitting doorstop is to make sure you temporarily wedge the door partly open or even shut during fitting to avoid trapped fingers or bumped heads when people come through. If you’re still unsure of the best doorstop to buy, then please feel free to contact our friendly and knowledgeable staff who will be more than happy to help.